Learn about the single-page navigation model and how you can implement it in your own app by using PageControl objects and WinJS.Navigation features. One of the simplest and most commonly used forms of navigation is the hyperlink. Here's HTML code that creates a hyperlink that navigates to page2.html. Because it's a relative link, the system assumes that page2.html is a local page that's part of your app, relative to current document's base URL. For example, if the link appears in /folder/default.html, clicking the link takes you to /folder/page2.html. Note If you have optimized your app for localization (which is always a good idea), this behavior varies based on your localized content folders under /folder/. See Globalizing your app. You can omit the package name if you want. You can use the ms-appx URL scheme to refer to any file that is included in the app’s package. However, we recommend using relative URLs because they're resolved automatically based on the document's base URL. The screen goes blank while the app loads the next page. The script context is destroyed and must be initialized again. The app might receive system events but not handle them because the script context is being destroyed and reinitialized. Using single-page navigation provides better performance and provides a more app-like experience than top-level navigation. Navigation controls are not automatically provided in new Microsoft Visual Studio projects, so a top-level navigation to a new page means there's no way to get back to the first page unless you manually create a link or other navigation mechanism to go back. Also, your start page is the place to define how your app manages its life cycle—how it behaves when it starts up, shuts down, or is suspended. If you have multiple top-level pages, each one must contain logic for managing the app's life cycle and state. Which control should you use to bring content into your main page? You can use the Document Object Model (DOM) to load documents from another source. For simple HTML content (content that isn't interactive and doesn't contain script references), use an HtmlControl object. For external web content, use the x-ms-webview control whenever possible. Compared with an iframe, this control provides better isolation, navigation, SmartScreen Filter availability, and support for sites that can’t be hosted in an iframe. For all other content, use a Page control. The next steps show you how to create an app that contains multiple PageControl objects and how to use the single-page navigation model to navigate between those pages. Note When you run Visual Studio for the first time, it prompts you to obtain a developer license. 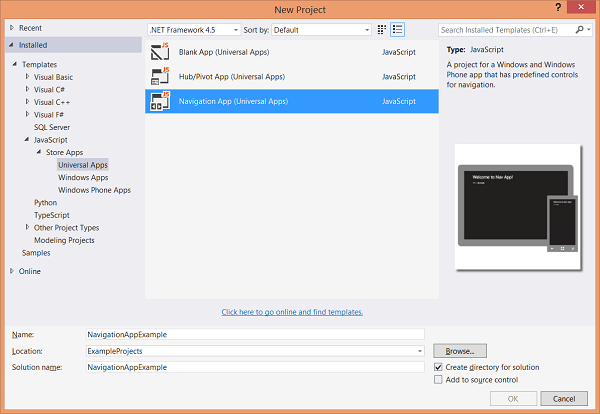 In the center pane, select the Navigation App (Universal Apps) project template. In the Name text box, type a name for your project. The examples in this topic use "NavigationAppExample". Your new Navigation App project contains a start page, a home page, and some additional supporting files. It looks like this in Solution Explorer. 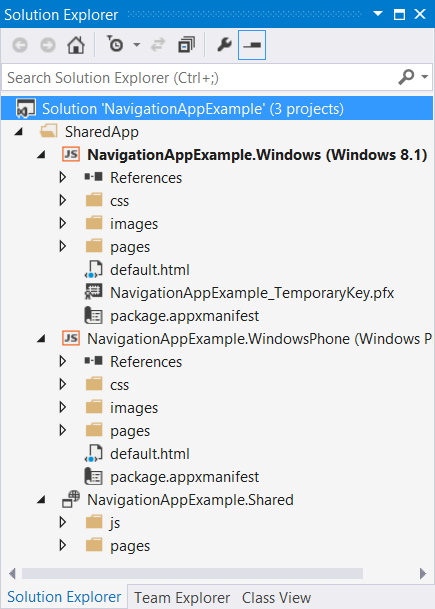 Your new Navigation App project includes a number of files. Some are specific to a Windows app, some are specific to a Phone app, and some are shared. home.html—the home page. It displays a "Welcome" title. default.js—specifies how the app behaves when it's started. home.js—specifies behavior that's associated with the home page. default.css—specifies Cascading Style Sheets (CSS) styles for the content host page and for the app as a whole. home.css—specifies CSS styles for the home page. The project also includes the package.appxmanifest file, which describes the app package. Finally, the project also includes several image files, like splashscreen.png for the splash screen image, and storelogo.png, which is used for the Windows Store. Here is a screen shot of the Windows app. Here is a screen shot of the Phone app. Notice that the content you're seeing isn't defined in the default.html file. It's defined in the home.html file, a separate page. It's the PageControlNavigator that retrieves the content of the home page and displays it inside default.html. The navigation control, PageControlNavigator is shown here. It defines several functions that are used for navigation. This control is implemented in navigator.js. ), // . . .
// The 'nav' variable is set to WinJS.Navigation. A DIV element that's declared as the app's navigation control (in default.html) provides the content host for all of the app's pages. The DIV element uses the WinJS data-win-control attribute to declare itself as the navigation control, and this control provides the navigation model for the app. All page content is loaded into this DIV. Here's the complete markup for the default.html page. In the next steps, you'll learn more about adding pages with the PageControlNavigator and the PageControl object. 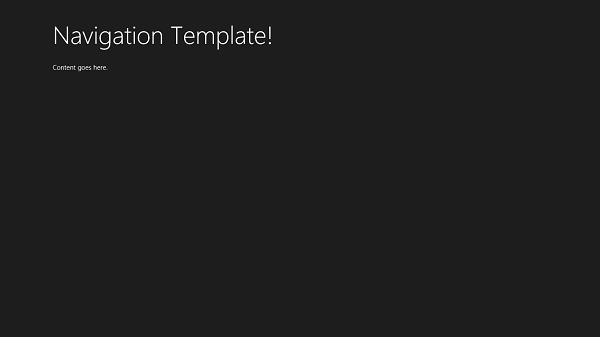 Add the new page using the Page Control item template in Visual Studio. Add code to navigate to the new page by using the WinJS.Navigation.navigate function. Tip This function does not perform navigation directly, but invokes the WinJS.Navigation.onnavigated event, which is handled in navigator.js. Code in navigator.js calls the ready function in your new page. Typically, you don't have to modify navigator.js. Add UI and event handlers appropriate to your app, if necessary, to invoke the page-navigation code. A page has a set of predefined methods that the library calls automatically, in a predefined order. The WinJS.UI.Pages.define function exposes these methods for implementation. In Solution Explorer, right-click the pages folder and choose Add > New Folder.Note For this example, we add a Shared page. You can add unique pages to the Windows or the Phone projects, as required. Name the new folder page2. Right click the page2 folder and select Add > New Item. In the Add New Item dialog box, choose Page Control in the middle pane. Name the page page2.html and choose Add. The page2.html file is created in the page2 folder, along with two other project files: page2.css and page2.js. Together, these files represent a logical page. Tip If you add the item template elsewhere in the project, you may need to update script and CSS references in page2.html. Open page2.js and verify that the URI is correct in the define function. Here's what it should look like. Now, modify your new page so that it displays a different message and the day of the week. Open page2.html. The Page Control item template creates an HTML page that contains a header section (which contains a back button) and a section for the page's main content. Replace the main content section with this one. Your page2.html file should now look like this. Open page2.js. The PageControl includes a set of predefined functions that get called automatically, in a predefined order. The Page Control item templates include the ready function and updateLayout and unload functions for you. The PageControlNavigator calls the updateLayout function when the user switches between portrait and landscape or changes the app windows size. This topic doesn't show you how to define the updateLayout, but it's something that every app should do. See Guidelines for resizing windows to tall and narrow layouts and Responsive design 101 for Universal Windows Platform (UWP) apps. The ready function is called when the page's DOM has been loaded, controls are activated, and the page has been loaded into the main DOM. 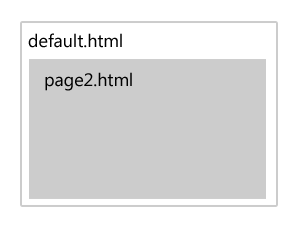 Here's the page2.js file that the Page Control item template created. Modify the ready function so that it retrieves the span you created in step 2 ("dayPlaceholder") and sets its innerText to the current day. You've created and customized a page. In the next step, you'll enable the user who's running the app to navigate to your page. When you run the app right now, it displays home.html; there's no way for the user to navigate to page2.html. A simple way to help the user get to page2.html is to link to it from home.html. If you run the app and click the link, it seems to work: the app displays page2.html. The problem is that the app performs a top-level navigation. Instead of going from home.html to page2.html, it goes from default.html to page2.html. Fortunately, the PageControlNavigator control makes performing this type of navigation fairly easy. The PageControlNavigator code (in your app's navigator.js file) handles the WinJS.Navigation.onnavigated event for you. When the event occurs, the PageControlNavigator loads the page specified by the event. In your home.js file, define a click event handler for your hyperlinks. Call the preventDefault method to prevent the default link behavior (which would navigate directly to the specified page). 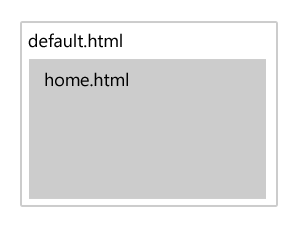 In the ready function in home.js, attach the event handler to your hyperlinks. That's the last step. Here's the complete code for your home.js file. Run the app and click the link for page2.html. Here's what you see. This time the page is displayed using the proper navigation pattern. The Page control template includes a back button that is enabled when you use the WinJS.Navigation functions to navigate. When you use the WinJS.Navigation functions, the app stores navigation history for you. You can use that history to navigate backward by calling WinJS.Navigation.back or to navigate forward by calling WinJS.Navigation.forward. Note Windows Store apps typically use one of two navigation patterns (flat and hierarchical). We recommend that you do not use the BackButton object in flat navigation apps. For details, see Navigation patterns. Navigation history is not automatically stored when your app is suspended or shut down, but it's easy to store this info yourself. Use the WinJS.Navigation.history property to retrieve the navigation history and use the WinJS.Application.sessionState object to store it. To ensure a smooth suspend/resume experience, it's best to store this info each time the user navigates. When your app resumes, retrieve the history info from the WinJS.Application.sessionState object and use it to set the WinJS.Navigation.history property. For an example of how to use the WinJS.Application.sessionState object to store and restore session data, see Part 2: Manage app lifecycle and state. For more info about suspending and resuming, see Launching, resuming, and multitasking. You learned how to use objects and methods of the WinJS.UI.Pages namespace to support the single-page navigation model. You learned how to build apps using the single-page navigation model. You used the PageControlNavigator class, provided by the templates, to implement this model in your own app using PageControl objects and WinJS.Navigation features.